The last time I had set foot in this inn with my husband was around 20 years ago. I’m not quite sure why it has taken us so long to go back. It’s obviously a bit of a local secret, though, as when we turned up at 6pm on a Friday in June, it was already pretty busy. We couldn’t work out if this was a freehouse. It seemed very individual as a pub but is owned by Enterprise Inns and run beautifully by leaseholder, Lee Bush. Quieter at lunchtimes and during the week, it’s well worth the effort of finding it. There are several routes leading to the inn, and some are a little narrow. We arrived via Alderholt and passed the picturesque Alderholt Mill, which is a lovely drive. On the evening we visited, it was pleasing to see a variety of people visiting this welcoming and friendly hostelry; families with children, local farmers, professional workers en route to home, young couples and friends. 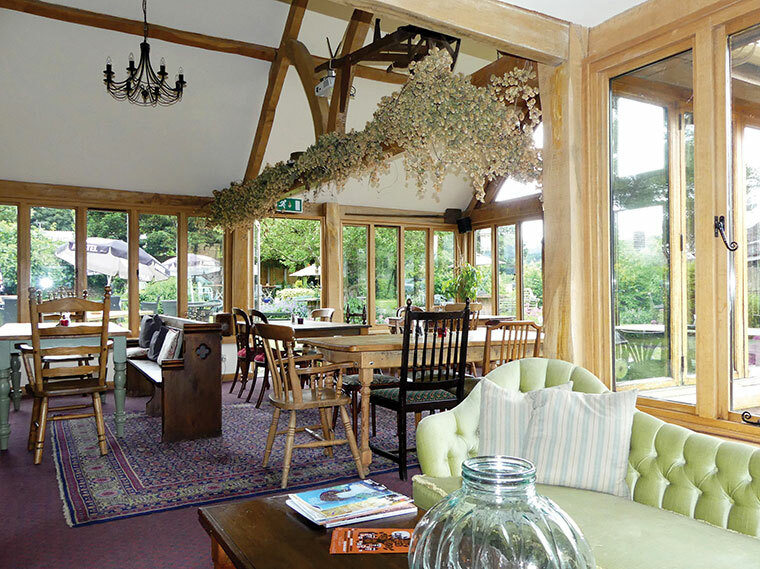 You can choose to go into the restaurant or conservatory for lunch, afternoon tea, or dinner, sit out in the garden on a warm day, or choose one of the two bars to sit in with a beer. There’s a good range of ales to choose from: Summer Lightning from the Hop Back Brewery, Flack Manor Double Drop – a favourite of the locals, Adnam’s Ghost Ship and on the day we visited a guest ale – Timothy Taylor Knole Spring – a blonde ale, plus lagers and a range of ciders. There’s also an impressive range of gins, which continue to grow in popularity. We liked the wine list, which allows you to have just a glass of many of the selections, and not only a bottle. Anyway, I digress. We were there to try out the menu and boy were we in for a treat. 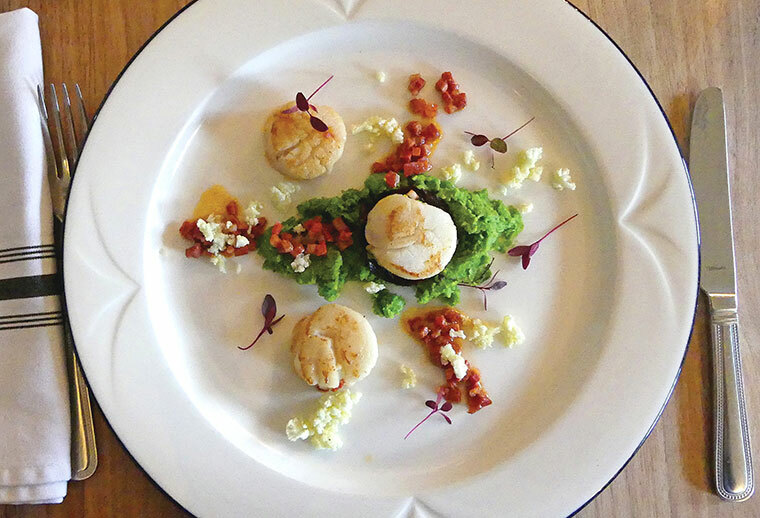 Compiled by the two chefs, Andy and Jamie, who work as a great team, we selected Asparagus, poached egg with a lemon and cream sauce for Paul, my partner, while I fancied the sound of Pan-seared scallops, split pea puree, chorizo and truffled cauliflower couscous. 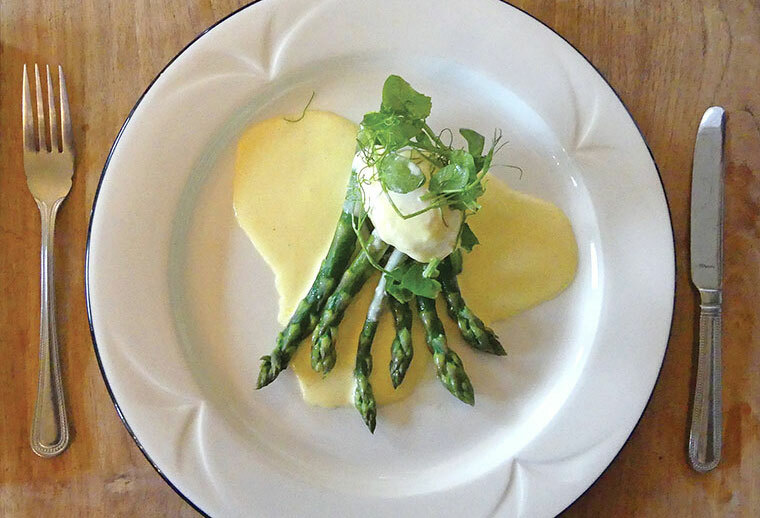 The asparagus was cleverly cooked so it still had texture, and the lemon sauce was divine. My scallops were soft, cooked to perfection and worked so well with the little pieces of chorizo and the tiny crunchy cauliflower pieces. 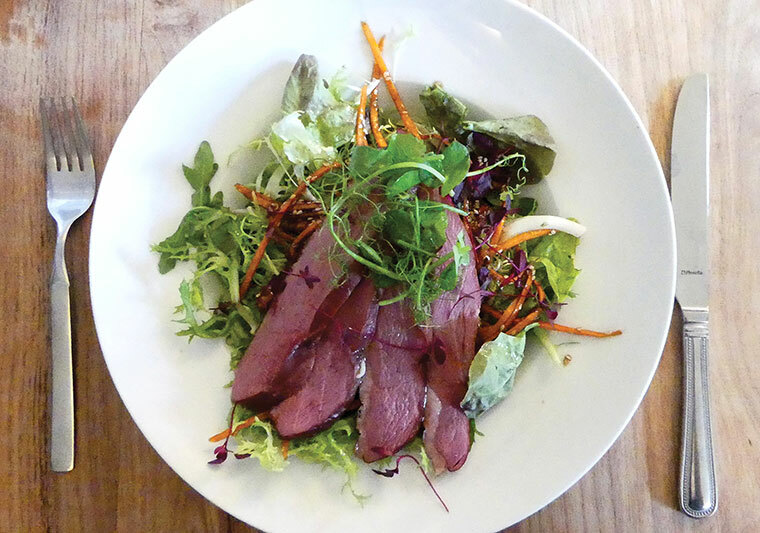 We were looking forward to our main courses of Smoked duck salad with orange and spiced pecan nuts, dressed with honey, ginger, soy and coriander and New age lasagne of pulled beef brisket, in a rich tomato and truffled béchamel sauce. This was delivered to the table with garlic bread and a bowl of coleslaw. The duck salad was a new experience for me. It was very lean and not dissimilar to the taste of smoked gammon. The pecans and sauce were delicious. They were presented with a flurry of salad leaves and thinly sliced crunchy carrot. Paul enjoyed his up-market lasagne and garlic bread. We both complimented the food to Roxanne, who was looking after us that evening. Now it was time for a decision – should we go for a dessert? I couldn’t resist when I found one of my favourite ice-creams on the menu: New Forest Stem Ginger, which arrived garnished with strawberries and blueberries. I liked the fact I could choose how many scoops I wanted. I decided on one, as I was pretty full by this time. 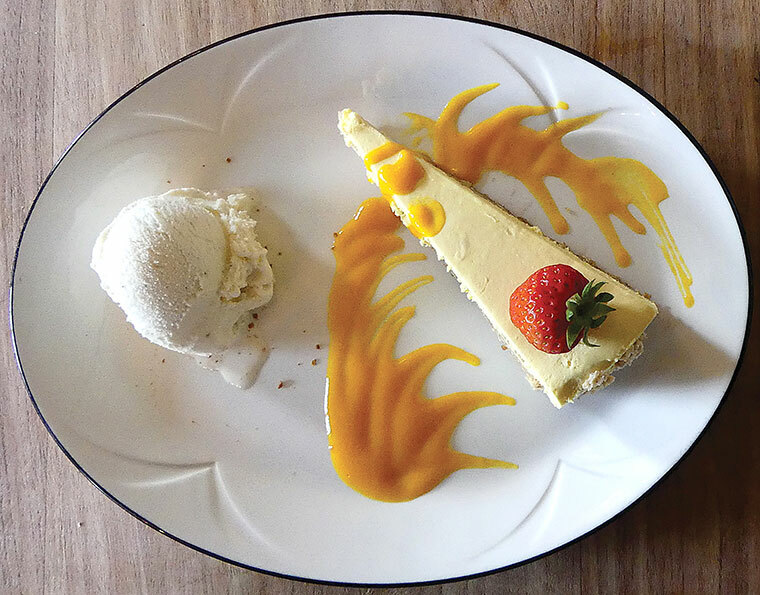 Paul went for it and plumped for the Mango and passionfruit cheesecake served with vanilla ice-cream. To accompany our food we had chosen a glass of Pinot Grigio delle Venezie white, and a gin and tonic. We both thought the food was exceptional for a pub and it seems to cater for discerning palates. We also liked the fact that you could choose either something traditional, or something slightly more adventurous for your meal. There is a pie of the day, which varies and fish pie was on offer the day we visited. At lunchtimes, there is also a lighter, sandwich and ciabatta menu; all those listed are served with chips and salad. We definitely plan to go back and have added it to our list of places to take friends and family. For info, there’s live music with the DamJam on the last Thursday of every month and if you think you might overindulge, there are five en-suite letting rooms and two holiday lets on site, so you could make a weekend of it and go for a lovely country walk, or go fishing nearby. Just ask at The Compasses Inn for more details.